Breakfast Cereals Are Full of Synthetic Ingredients, One is Found in Paint Thinner – Trisodium Phosphate (TSP) in Cereal or In Food: Is it Really Safe? Trisodium phosphate (TSP) is a common food additive in cereal and other foods. TSP is used in cereal production to improve its color and help in the production process. Trisodium phosphate is also added to cheeses to improve their melting properties and help keep their shape. Some types of bread and pizzas contain TSP because it also acts as a leavening agent. You may also find trisodium phosphate listed as an ingredient in processed meat because it helps keep the processed meat moist. Although the Food and Drug Administration (FDA) has approved its use in the food industry, many people question if TSP is really safe in cereals. For example, the U.S. Environmental Protection Agency (EPA) lists TSP as an irritant that can affect the skin and eyes. TSP is also added to industrial products like cleaning agents, soldering flux, and as a painting enhancement. Should you be concerned about trisodium phosphate in cereal or seeing it listed as an additive in other foods? What does scientific research really say about trisodium phosphate in food? In this article, I will examine the claims about paint thinner in cereal and if TSP in your bowl of Cheerios or Lucky Charms is something you should worry about. What is food grade trisodium phosphate? Food grade trisodium phosphate means that the chemical compound is processed to high enough standards so that it’s suitable for use in food production. Let’s look in more detail at ways the food industry and other industries use TSP in their manufacturing process. Most people want to know if trisodium phosphate is safe to consume when it is used as a food additive. Trisodium phosphate also has properties that make it an effective surface cleaner. Trisodium phosphate is used to kill foodborne viruses from potentially contaminated meat and vegetables. Some athletes use sodium phosphate supplements to improve their performance and increase their anaerobic threshold. Of course, the fact that trisodium phosphate in food is regulated by the FDA doesn’t mean that everyone wants to eat cereal containing TSP. In addition, when you look at the list of ingredients on a box of Cheerios or Lucky Charms, you will see that these are highly processed food items. For example, trisodium phosphate in cereals is not the only additive that could have implications for your health. You may find that breakfast cereals contain high amounts of added sugar and corn syrup that can lead to obesity or increased blood glucose levels. Also, marketing phrases like “low fat” or “contains whole grains” may make you think that you are eating a healthy product, when, in fact, there may be only small amounts of grain. At the end of the article, I will look in more detail at why TSP in cereal may be bad for you. Does cereal really contain paint thinner? No. Cereals do not contain paint thinners, even if trisodium phosphate is listed as an ingredient in the cereal. The reason why some people claim that certain cereals contain paint thinner is because TSP is also an ingredient in some paint thinners. Paint thinners contain many poisonous ingredients that are never added to any type of breakfast cereal or any other type of food. There are also many other natural products that are safe to use when consumed properly but could cause health issues if they are abused. TSP is commonly used in breakfast cereals and many countries have approved its use, therefore, many people agree to consume products with TSP. But does the fact that the FDA approves trisodium phosphates as “generally safe for consumption” mean that TSP isn’t harmful? Just because a substance is classed as “non-toxic” or “not poisonous” doesn’t mean that it can’t impact your health. Although trisodium phosphate in food may not be bad for you if manufacturers have followed appropriate practice, some researchers are concerned about its impact on general health. Food grade trisodium phosphate tends to be in foods that are highly processed and are classed as “junk food.” It is known that many processed types of meat, sausages, and even breakfast cereals have little nutritional content and are “beefed-up” with sugars and fats. However, research points to the fact that TSP in processed food could pose a health risk. 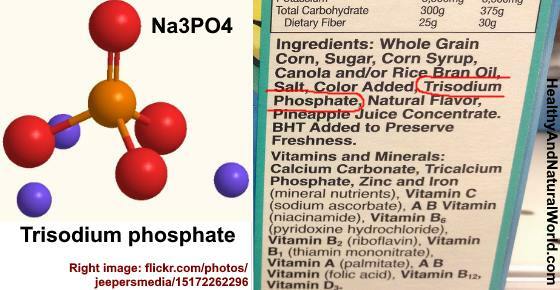 Why is trisodium phosphate added to foods? If trisodium phosphate could pose some dangers to health, why is TSP used in food production in the first place? Meat industry. TSP acts as a preservative agent where it can be injected into fresh meat to extend its shelf life. This also helps to improve the meat’s flavor, appearance, and tenderness. Dairy products. Some dairy products like soft cheese or hard cheese contain trisodium phosphate to improve the melting process. Often, TSP is added to spreadable cheese to “improve” its texture. Soft drink’s industry. Some flavored soft drinks and colas contain phosphorous additives to increase acidity and create a “fruity” flavor. Also, phosphates in colas prevent the beverage from turning pitch black. Why Is There TSP (Trisodium Phosphate) in Cereal? For many people, the greatest concern is the addition of trisodium phosphate in cereals, especially because they are popular with children. For many, breakfast is the most important meal of the day and should give us enough energy and nutrition to “kick start” the day. Trisodium phosphate is in Lucky Charms, Cinnamon Crunch Toast, Golden Grahams, and some varieties of Cheerios. Many types of Cheerios contain tripotassium phosphate and I’ll discuss this chemical later in the article. TSP in cereals is used as a leavening agent to give breakfast cereals a porous, crunchy structure. So, it seems that it’s not just trisodium phosphate in cereals that should be of a concern. The high salt and sugar content of some cereals and their low fiber content could mean that you are not getting the type of nutrition that you may think. Of course, not all breakfast cereals fall into this category and at the end of the article, you can find out about healthy breakfast options. Is Trisodium Phosphate in Food Bad for You? Of course, trisodium phosphate in cereals or other foods certainly doesn’t mean that there is paint thinner in your breakfast. It’s important to remember that your cinnamon toast crunch or bowl of Cheerios only contain ingredients and additives that the FDA has approved. However, there are some studies showing the potential harm of phosphate additives. Tripotassium phosphate in Cheerios is the main phosphorus additive, however some varieties of Cheerios have TSP instead. Tripotassium phosphate has a different chemical composition to trisodium phosphate. However, being a phosphorous substance, foods and breakfast cereals containing tripotassium phosphate can also increase your phosphate levels. Conclusion: Is TSP Safe to Eat? Of course, the main question is: is trisodium phosphate safe to eat? From one point of view, the FDA has approved TSP for its use in the food industry. This is allowed to improve the taste and color of cereals and preserve the texture and freshness of certain meats and cheeses. Like with most food additives, consuming small amounts probably won’t do any harm. However, as many studies have shown, even small amounts of food additives like trisodium phosphate could have a negative impact on health. TSP in cereal or food could cause you to get higher than recommended levels of phosphates, even if it is food grade trisodium phosphate. So, the question you should ask: do I want to consume chemical substances like TSP, especially if they don’t provide any nutritional value? There are much better and healthier breakfast options than consuming cereals containing trisodium phosphates, artificial coloring, and hidden sugars. Eggs for a healthy breakfast. Start your day with a boiled or poached egg. Consuming eggs in your diet is a great way to get healthy protein and other nutrients. They will also keep you feeling fuller for longer and help prevent snacking. You might also be surprised that eggs don’t contain as much “bad” cholesterol and fat as you may think. Breakfast smoothies. For a nutritious healthy breakfast without any chemical additives, why not try out a green smoothie? These are low in sugar and fat but high in nutritional content. They will also help you flush toxins from your body and give you enough energy for the day. Cereals with no TSP. Of course, not all breakfast cereals are bad and contain unwanted phosphorus additives. So, if a bowl of healthy cereal with milk or milk substitute is your morning choice, check the packaging carefully to see beyond the marketing hype. NIH. Sodium phosphate, dibasic, anhydrous. FDA. Determining the regulatory status of a food ingredient. FoodGovUK. EU approved additives and E numbers. Environ Sci Technol.2006 Jan 15;40(2):590-4. Saudi Pharm J. 2017 Sep; 25(6): 934–938. Food Sci Biotechnol. 2004 Aug; 13(4): 425–429. J Sci Med Sport.2008 Sep;11(5):464-8. Semin Nephrol. 2013 Mar; 33(2): 180–190. Dtsch Arztebl Int. 2012 Jan; 109(4): 49–55. J Agric Food Chem.2000 Mar;48(3):880-4. Foods. 2016 Jun; 5(2): 38. NCBI. Preservation and physical property roles of sodium in foods. Adv Chronic Kidney Dis. 2011 Mar; 18(2): 113–119. Adv Chronic Kidney Dis. 2013 Mar; 20(2): 150–156. BMC Cancer. 2013; 13: 257.